Around the blogosphere and Facebook, many are paying tribute to the artist, activist, feminist icon and chingona Frida Kahlo. Last year I remembered her anniversary. Today is her birthday. Over a hundred years after her birth, Frida remains memorable. In addition to her art, much of this has to do with her honesty about emotional and physical pain, her activism, her love of country and her self-identity as a woman. 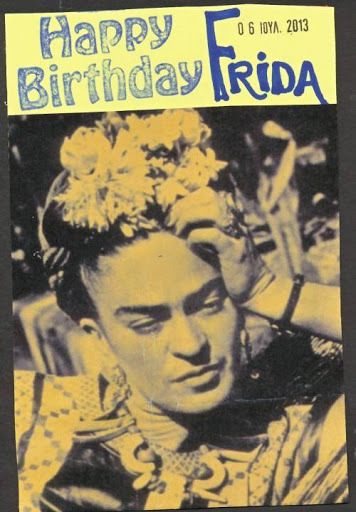 These are reasons to celebrate Frida’s birthday. Her honesty in her response is precisely why she is remembered. Similiar to her au naturel face of unplucked eyebrows and unshaven upper lip, this was a woman who was comfortable with her identity. What she highlighted in many photographs, was her indigenous and mestizo roots and the culture of Mexico. This was a woman who lived a life in physical pain from several injuries and still painted. She was a woman who lived a life marked by emotional pain and depression. Her beloved mother, Matilde Calderon, died of breast cancer. Her father, who encouraged her to paint after her horrible accident died of a heart attack. She had several miscarriages. Her husband, Diego Rivera, was infamously unfaithful. Frida’s philosophy of life was described just days before her death, in her still life, using the words Viva La Vida (Long Live Life). This was a woman who took pain and depression, placed it on canvas along with her vision, and created beauty. It takes a strong woman to translate tragedy into beauty. That, right there, sums it up. Happy Birthday, Frida. *Letter to Ella Wolfe, 1938, quoted in Frida: A Biography of Frida Kahlo by Hayden Herrera In a footnote, Herrera writes that Kahlo had heard this joke from her friend, the poet José Frías. **Quoted in Time Magazine, “Mexican Autobiography” (27 April 1953) a year before her death. It’s my mother’s birthday. She’s on the other side of her early 80’s. Still a rebel with a cause. A chingona of the first degree, a strong woman. Loves to eat, tell us stories, have a beer sometimes (only Corona), and laugh. We celebrated yesterday at a birthday barbeque in the backyard surrounded by four generations. Her favorite menu of carne asada, corn on the cob, chocolate cake with raspberries were among the spread. We forgot her diabetes for one meal. We didn’t want another tussle. Amidst the talk of another year gone by, she begins counting grandchildren and greatgrandchildren, thirteen in total. Mom leaned back, she looked pleased and nodded. I heard her whisper, “Maybe my last year.” She’s been saying those words for the last several months. She reminds me that she’s glad I wrote down the stories of her childhood four years ago and gave them to my siblings and cousins. “It’s a good title, ‘Remembering before I Forget,’ she said, “because I’m really forgetting now.” And that reminds me that I have to revise the stories. Her cousin says that she recalled a few incidents incorrectly. She turns melancholy. It’s hard for her being the last sibling alive. We never had grandparents on her side of the family. She was orphaned at a young age. Remembering that she’s the last one alive is hard for me too. Sometimes I feel guilty we still have her and my cousins don’t have their moms and dads anymore. I think about how they feel when they see her. Mom looks to a near future of death, preparing for it by making all the arrangements and payments for her plot, selecting her songs, specifying the flowers, writing down her pall bearers (to include her granddaughters), giving me cards for the man who releases the doves. Everytime I hear her say this I choke up. I’m gonna cry. I know it. And I don’t care. Many, many people will cry. And then I’ll remember all the funny stuff she says and does, all the while laughing. We’ll cry and later laugh, loud. That’s a family thing, we laugh loudly. We’ll remember her push for college, her feistiness, her marches for justice, persistence, her green thumb, her love of reading, her travels, her stories about her barrio. We’ll remember it all. But the time to cry isn’t now. We toast to her health and more birthdays to come. Mother’s Day is fast approaching. 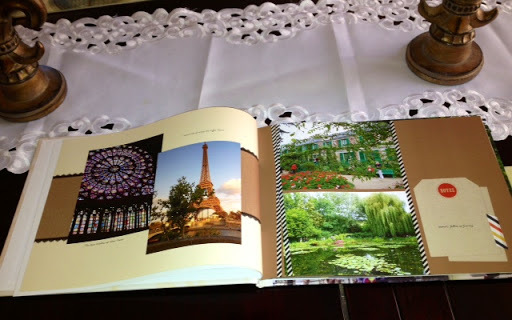 When making my mom her gift (the photo book above) I thought about all the gifts she’s given to me. It’s not the knickknacks, stationery and candles but other gifts that have lasted a lifetime. Mom is legally blind, hard of hearing, diabetic and uses a cane-sometimes. She can’t go alone to Rite-Aid a few blocks from her house. Honestly, I didn’t want to go because she needs a lot of care-which she doesn’t recognize. No one volunteered; no one had the cash lying around to make a Paris trip. Mom can be buen chingona and when she wants what she wants she doesn’t give up. After her repeated requests, some days of guilt feelings, and knowing that this could indeed be the last trip, I used my miles and credit card to arrange the trip for the end of April. She was ecstatic. I was hesitant. It was a journey filled with turbulence (re-directed flights, delays, personal mishaps), but we survived. More than that, we laughed, ate flaky pastries, drank lots of café crème, and best of all she told me stories I hadn’t heard before. On the train to visit Monet’s Garden (Mom loves flowers), we struck up a conversation with a woman from Tennessee. She mentioned that the last time she was in France was in 1966, after her graduation. She looked at me and said, “Before you were born.” I let her think that. Later, while having lunch, my mother commented on the woman’s mistake. “You got that gift of youth from me,” she says. Mom has always looked 15 years younger than her age. Medical personnel make her show her Medicare ID twice, verifying it with her California ID and then remark on her youthfulness. She then proceeded to tell me about the time she dated a younger man, he was 28, and she was 51. Holy smokes, why didn’t I know that? When she married my dad, who she met at a dance on the Air Force base, she received a shock when they went to city hall for a marriage license. He pulled out a permission slip from his mother, he was 17 years old, and she was 25. Mom loved visiting the cathedrals in Paris. Although I’m no longer Catholic, I took her to Mass at Notre Dame. She insisted on kneeling on the hard wood footrest during the appropriate times, even though I had to pull her up when it was time to stand. There are several side chapels at Notre Dame, one of them the Virgin of Guadalupe, her favorite. She lit a candle and knelt before the image for several minutes. Afterwards, we talked about the small altars she constructed in every place we lived. I often saw her praying on her knees in the early morning. She said sometimes we were so poor she didn’t have 50 cents in her pocket (we were four kids, she was divorced) but something always came through. She’s a strong woman and she gave me the gift of faith. After a trip through Musee d’Orsay, Mom commented on a painting, “One of my favorites.” She recalled first seeing the Renoir painting in her art book at community college. She received two B.A. degrees, which took eight years, while working full time, with four kids to support. She gave me the gift of perseverance and goal setting. Our trip was almost over, and we had left shopping for souvenirs to the end. We started out early, the streets looked desolate, no crowds, and few cars. It was May 1. I had forgotten that May Day is a very big thing in most European countries and most stores would be closed. We were almost at our Metro stop when Mom noticed a crowd waving French flags and I noticed a huge police presence on a side street. Of course, she wanted to see what was happening, up close. Crowds of people gathered for their May Day march. Chanting, flags, and orange smoke filled the air. We remained there for 20 minutes until it looked too crowded and dangerous to stay. Mom acquiesced to leaving after yelling “Viva Francia,” with an upheld fist. Oh-kay. While on the empty metro, Mom told me the story of her participation in marches. I already knew about her involvement in demonstrations with Cesar Chavez and our community to get more parks and recreation for families, because she took us along, but I didn’t know the whole story. “The scariest march was against the Ku Klux Klan,” she said. My head swiveled towards her at that remark. We didn’t live in the south we’re California people. She told me that the KKK came to our hometown in the ’70’s and planned a convention and showing of “Birth of A Nation,” at our largest venue. The info leaked out, and the “Committee Against Racism,” which Mom was a member, obtained a permit to protest in front of the venue. “When I saw these men with steel pipes, baseball bats, bricks, I knew they would use them.” In the face of that, she remained with the protest. The protest turned violent between the protestors, KKK, and police. The KKK left and has never returned to this town. From her involvement in these protests, she gave me the gift of commitment to social justice. On the last day of our trip, after whirlwind shopping, we paused to eat in Café Victor Hugo. She remembered he was the novelist of the Hunchback of Notre Dame. She recalled her favorite teacher, Mrs. Roddy from Nebraska. I asked what made her think of a teacher and where she was from after 75 years. Mom has always been a voracious reader. I remember in fifth grade picking up her True Confession magazines, in sixth, reading her copy of Mandingo, and in eighth grade reading her college texts on sociology. We had a large supply of books throughout my childhood when she purchased, on a long payment plan, the Encyclopedia Britannica, Bible Stories, and the Children’s Classics. Even though Mom is legally blind, she reads the headlines of her daily newspaper and reads large print books, slowly, but she finishes. She gave me the gift and love of reading. I’m glad I went on this trip with my mom. It did bring her aging into intimate view, which made me sad. But she gave me more happiness than she’ll ever know. Her long life has been meaningful, she’s passed on gifts that I hope I’ve passed down to my kids, and she’s given me priceless memories.